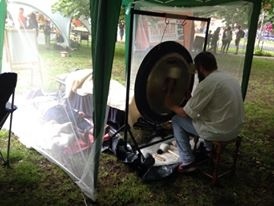 So, although I was oblivious, I’ve since been told that something rather amusing happened yesterday during one of the many mini 10 minute gong baths at Beech Road Park Family Fun Day. Those of you who were there will remember that over a period of just a couple of minutes, the wind started to pick up and the rains started to fall. I had just started a gong bath and was aware of the change in weather but was, as usual, completely engaged in the meditative state the gong puts you in, as were the three people who were laying out on their gong beds in front of me. By all accounts, the sudden downpour had people screaming and running for cover, and mayhem was being conjured up all around the park. At one point, a marquee reportedly started to leave the park of its own accord and needed chasing down by all and sundry! Well, suffice it to say that, with pandemonium all around, me and my group of Gong Spartans apparently looked quite the picture, absolutely oblivious, completely mesmerised, faces the very picture of calm. I think we may have even gathered a crowd of amused observers 🙂 There’s nothing quite like tranquility amidst clamour. Big thanks to everyone who came and enjoyed the gong, or came for a chat or took a card or a flyer.